1 bedroom lake front condo. Nestled at the end of State Route KK in Osage Beach and the 23mm by water. This condo is nicely equipped for an enjoyable stay. It has comfortable living room furniture and an electric fireplace. All the comforts of home at an affordable price. The bedroom has a queen size bed. The deck over looks the lake and has a patio table and chairs and a gas grill. Tennis court and pool. Pool overlooks the lake. Boat ramp on property, check on availability of boat slip. Laundry facilities available also. Small quiet complex. Partyers need not inquire. Amenities: Relax in our COZY CONDO! Its always a beautiful time to visit Lake of the Ozarks and our Cozy Condo. Accepting reservations for Spring, Summer, Fall & Winter. Book early for assurance of the dates you want. If the date you want looks unavailable please email as we have another property. Great pool overlooking the lake. Fish from the docks or play tennis. Enjoy what the Lake of the Ozarks has to offer with our great rates. Out of the city limits so tax rate is less than most. Laundry room on property. Activities: KK area offers a choice of 2 golf courses, Ozark Distillery & Brewery. Great Stone Coffee, restaurants by land or water, shopping and a music show. Winery close by, and State Park. Boat and PWC rentals, para sailing. For the kids of all ages, miniature golf, go carts, Timber Falls Indoor Water Park, Miner Mike's indoor amusement park, movie theater. Rick and I bought this condo originally for a place to put our own boat. We thought we would just use the condo for when we had family come to visit. A friend turned me onto using it as a vacation rental. At the time I was a stay at home Mom with 4 kids, three were in school and the 4th was getting ready for Kindergarten. It seemed a good way for me to still be at home but earn income to help pay for the condo. I loved it. It has kept me busy and in 2008 we bought a second unit in the same complex and building. It's been a family business, the kids helped clean and now they are grown and still help in the summer. I have enjoyed meeting all of our guests. This property was close to our home in Osage Beach. It would be easy to use our boat. We also liked the quaintness of the complex. This property is a small family oriented complex. There are only a couple of us that rent our units. The other units are owned by people that either live there full time or enjoy their home away from home. They are friendly to the guests that rent our units. Our Cozy Condo sits at the waters edge with a beautiful view across the lake. We supply salt & pepper, sugar & creamer. All linens are provided as well as a starter roll of paper towels, toilet paper and trash bags. We also supply dish soap and hand soap. It’s our second stay. Nice romantic setting, comfortable and equipped with all the essentials of a weekend getaway. Maureen was wonderful! Quick responses. Condo was just what we needed to for a weekend getaway. Nice cozy, beautiful scenery. Very relaxing experience. Owner is very easy to work with and condo is clean, complex is safe and the water view is nice. We’ve stayed here many times and will continue to do so. We enjoyed our stay in the cozy lakefront condo, just steps away from the sidewalk along the water's edge with so many comforts of home. Cozy and cute! Great location. Quiet and relaxing. Met our needs. Would recommend for a couple who needs a break from the hustle and bustle of life. 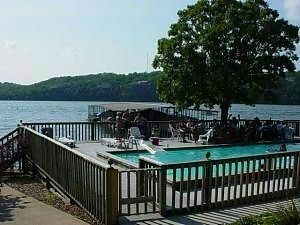 Osage Beach is located on beautiful Lake of the Ozarks. Condo Location: KK area past Tan Tar A resort. 23 mm by water. We are close to several golf courses, restaurants, State Park, winery, and shopping.